[Addendum 12/09/2012 – This post has raised questions, and criticism – and, while I stand by the original aim of it, in hindsight I realise that it’s easy to read it in a way that I didn’t originally intend… I’ve left it here, unchanged, as I think it’s important to do so, but I’d urge anyone reading it to start by reading the following, clarification post first, and then come back and read these notes before you read the main article. The three key criticisms bear stating here. The first is that my position isn’t clear, and that I somehow represent CDS. I don’t. I don’t work in CDS, and although I have friends there, and we talk about what’s going on – I don’t represent them in any way. I do work for the University of Bristol, and I am occasionally involved in teaching at CDS – but this post is written from the point of view of an independent academic, involved in Deaf Studies work, looking on from the outside. The second is that it’s easy to read the post as if I’m talking about a willful closure of CDS by the University of Bristol. Again, I’m not. The university is, in fact, investing in CDS to ensure that it’s revisioned, and equipped for the future… the point of the post is to question where a critical Deaf Studies fits into that vision, and to wonder whether, in pursuit of something ‘other’ than what’s there Bristol might actually be discarding something that is of enormous worth. The third is that, by raising questions like this, I’m showing a lack of loyalty to CDS, to those who are working towards its future, and to the University in general – Looking at the post, I can see how that could be read into it… in fact, my intention was to do the opposite. As an academic, I can’t think of anything more exciting than researching and teaching about something that is truly world changing – and Deaf Studies is world changing. It might have been badly delivered, but my aim in the post was to point out the immense value of Deaf Studies to both the university and to the wider academe, and to wonder out loud whether it might ultimately benefit the university to keep it right in the centre of its vision for CDS. But… that’s no problem. Because inside I am buzzing! … and sad. But still buzzing. Not because I’ve had too much coffee. I have been drinking coffee – it was ropey stuff… and cold, out of a paper cup, served in a café that has taken austerity and turned it into an art-form, providing hard wooden chairs and tables, making sore bums and elbows, and tiled floors to freeze already-cold feet. No, I’m buzzing because, for the last 90 minutes, I’ve been a part of something very exciting. I’ve been idea-sharing with a student from the Centre for Deaf Studies. The discussion started, as it usually does, with an email asking me to chip in on an essay or a dissertation. It has to start that way really… Since I don’t actually work in Deaf Studies, it’s not so easy to just bump into me. 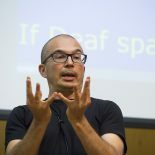 But people there do know that I exist – and so I get drawn into questions that have a particular relevance to my research, or to areas linked to Deaf Geography, or Deaf Space. Once started, conversations never stay on just one topic though. Today, for example, we started with the question of whether policy- or utopian- based approaches would be more effective in achieving lasting recognition of Deaf culture and language… but then the discussion wandered off all over the place. Utopian theory gave way to heterotopias, discourse theory, Social and Cultural models of disability, the commodification of culture, development theory and Orientalism, nationhood and separatist politics and performances of identity before finally alighting on heritage and cultural memory, and the tension between short-term, achievable, political gain… and long-term, unachievable, social transformation. All of it was fascinating. All of it was relevant. All of it, in true Deaf Studies style – was complicated and nuanced and knotty… and inherently difficult, and political, cross-disciplinary, and thought provoking and productive and challenging. The student left with a million new connections, and a million new loose ends… and a better sense of how everything “all ties together” in complex and beautiful (and confusing – sorry, my fault!) ways. I left thinking that, just for once, I might have contributed something meaningful and lasting to someone’s mental toolbox. And then, on the way back – just about the point my shoes started to leak – I also became deeply sad. Because, it struck me that those conversations are about to come to an end. Next summer, when the final cohort of CDS graduands tramps up the steps of the Wills’ building, across the stage, and exits into graduate freedom, CDS’ remit to inform the lives of undergrads will be over… and conversations like that will vanish from Bristol. The BSc has closed. The MSc is suspended… staff are heading out the door. Bristol is throwing it all away… and I still can’t quite work out why. Business: Did CDS not cover costs? Did they not generate enough income? Did their students cost too much? Experientially: Was CDS simply not up to scratch? Was its teaching, and delivery not good enough to live up to modern-day student expectations? Perceptive: Did CDS students and staff not fit the profile of ‘Bristol academics’? Was widening participation too wide? Were the courses too… vocational? Politically: Was CDS too hard to handle? Were the people just too awkward? Was it too much to force the ‘oppression’ agenda at all times? Did they refuse to play by the rules? Academically: Did CDS fail to establish the value of Deaf Studies? Did they not publish enough? Apply for enough funding? Establish a good enough REF submission? I’ve heard all of these proposed by different people, and they are potentially all significant problems. However, in the face of the quality and value of my conversation this morning, none of them is very convincing. Because – no matter how you play these problems – all of them are to be expected… indeed, if you know CDS at all, you’ll know that all are inevitable. You can’t expect a department to generate so much transformative ‘life’… without it also bringing up a few real, applied, academically-critical challenges. But… they are also all rectifiable… if there’s a vision for what might emerge. In CDS, and Deaf Studies, Bristol is sitting on an academic field that has the critical potential of Feminism – one that can utterly transform the way that we look at ‘humanness’. With an ongoing package of support, re-alignment, empowerment, skills-provision, encouragement, the university could work to further transform CDS; to grow it (with a strict hand too if necessary), into academic maturity, and then nurture it to flight. And it’s not as if it has to conjure success from nowhere. Waiting in the wings, ready for action, are a whole host of people and resources who are bleeding with frustrated eagerness to get stuck in. At least half-a-dozen new, eager, internationally reputable academics (some with growing publication records) who would be ready to invest their time and futures in CDS if the opportunity arose. More, if you count people who are prepared to affiliate, and others who are gaining their PhDs now. Ongoing conferences and new, innovative subject coverage tied into those academics, ready to come into the CDS fold. 3 possible masters programmes, and 3 undergrad programmes that could be put together almost instantly from those available – that would be, easily, the best in the UK/world. A vision for fully integrated online teaching and learning that could open up delivery beyond the UK. Numerous international universities and community/third sector organisations ready and interested in affiliative work. Could it all start again in another university – Yes, it could… and if necessary, for the sake of the field, I hope it will. But everything would almost need to be generated from scratch, taking time. For Bristol, the reputation is there… the groundwork and foundation is there. All that is required is a change of direction. But, to my knowledge, this is now unlikely to come… and if it does, it may be too late. I think, unless something changes radically, CDS in all but form (and maybe even that) will be gone by next summer. I think it will be thrown away. … and the saddest part is, I think the University that’s throwing it away, won’t even realise the enormity of what it’s done. Is this Paddy Ladd’s program? Or the other one? Probably need to clarify ‘program’… Paddy’s the Postgrad Director in CDS, and ran the Masters in Deaf Studies/Deafhood Studies. It’s that program that’s been suspended. The undergraduate degree (BSc) was canned last year. It is very sad to see over 30 years of excellence go, even your library is a treasure. While there are pressures in Universities to survive in a different financial climate, Vice Chancellors are looking for departments to cut and reinvest resources in more classical, incoming generating subjects. There is no space for a ‘Centre for Deaf Studies’ model – as much as we think there is a need for one. We need to transform into an ‘interdisciplinary model’ where academics are placed in their disciplines but they interact across departments to focus on ‘Deaf Studies’. This is the only way to ensure survival, in my view. On a higher level, we have lost the days when research was led by needs, it is now led by money. Who is going to create the greatest reputation and who is going to bring in the most students. Suddenly, research is not as free anymore – it is tied to financial gain. Lastly, it may be of benefit for staff to focus on other universities of a lower stature, such as the 94 group. While the larger universities are taking the classics, the smaller, ex-polytechnics, are looking for new subjects to fill the vacuum. We may well (I hope we do) see CDS survive, and evolve into something new. What I struggle with is that talk of a ‘new’ thing seems to ignore the fact that there was not just a ‘new’ thing, but an ‘Earth Shattering’ thing already there… that is being overlooked. In ten years, Bristol might have the best Centre for Deaf-related XY and Z in the world… but my view is (and it’s only my view), if it’s not got gritty, real, inter-disciplinary, Deaf Studies at its heart, then I think it’s actually sidelined the area that could have brought it the greatest income and reputational gain, and opted for something much less exciting. Interesting that you should be talking about situated interdiciplinarity – I think, in many ways, that you’re right. But I wonder how that serves the need to also teach a pan-disciplinary Deaf Studies curriculum that *does* seem to require a focal centre? I guess what I grieve over is the idea that, in 18 months, there won’t be that focus on ‘Deaf’, that allows such a range of discussion to weave in and out of a single frame of reference. That’s what I think is so unique about a focused Deaf Studies. I can’t agree with you more. But the reality of the financial climate has changed academia. In the past, academia was influenced by the direction of the academics but now decisions are made by management, who are influenced by various agendas. Even my own centre, the Centre for Community Engagement, has closed because of reinvestment in energies elsewhere. The justification for this change was that ‘community engagement’ should exist in all parts of the university and not just in one location. Unfortunately, I have found it to be a political move, rather than policy shift, in a bid to close a centre. But your question of survival is an important one – Deaf Studies, in whatever shape or form, must survive. I am not convinced that a focussed Deaf Studies is the future, at least until the Government changes their position on University funding. This entry was posted on August 29, 2012 by Mike Gulliver in DEAF, Musings and tagged Bristol, CDS, Deaf Studies, thrown away, vision.